The Deadstring Brothers are a curious hybrid – part out of Detroit USA, part out of Romford UK. Formed in 2003 by Kurt Marschke, their internet bio compares them to Exile-On-Mainstreet era Stones and describes them as having a menacing sound that draws equally on the melancholy of country ballads and the abandon of rock and blues. Their initial CD album, recorded in Kurt’s studio in Royal Oak, Detroit, was released on small indie label who were more interested in the British market than the North American. So the band found themselves touring the UK before they could even get their own gigs in the US and picked up a UK management company as well. It wasn’t until 2006 when Bloodshot Records, home of Ryan Adams before he went to Lost Highway and of Justin Townes Earl, took the Deadstrings on and released their second album, Starving Winter Report, and the band hit the road for dates with Shooter Jennings, that their profile started to rise in the US. A third release in 2007, Silver Mountain, followed and the band were still knocking out regular tours in Britain, and somewhere along the way replaced the original bass and pedal steel line-up with two talented brothers, Jeff and Spencer Cullum, whose Anglo take on deep-rooted American roots music fitted perfectly with Kurt’s vision of the Deadstring Brothers. Along the way singer Masha Marjieh got promoted from backing singer to sharing the frontline vocals with Kurt and the Deadstring sound was complete. Back in the UK for their sixth tour, albeit without Masha for the first time since she found life on the road hard to combine with her current commitments, I found the band treading a familiar path around the specialist Americana venues of Britain. My first Deadstring experience was in the SxSC club in Winchester, Hampshire, a regular stop-off for touring country rock acts, back in February 08, while Masha still fronted the band. Catching up with them again at the Boileroom in Guildford, Surrey, I was struck by how little Masha’s non–participation changed the sound – even though as an old Vinegar Joe fan from the Seventies, the guy-girl vocal combination has always worked for me. The trail for Americana/alt.country bands touring the UK is well-defined, with two or three promoters taking care of most US acts. It runs from Scotland, a particularly fertile area for the music genre, across to Wales with regular stops down the length of Britain and then back over to London where the Luminaire hosts most of the big names touring. Support slots are still mainly given to singers/duos with local support, though the Deadstring Brothers played a number of dates this tinme around with a young (that’s all under 25 years old) British alt.country band rapidly rising to national prominence called Two Fingers Of Firewater. They both played the tenth anniversary gig of a regular Americana night entitled Cosmic American Music Club in Nottingham which has hosted, among hundreds of artists, Gene Parsons, Ryan Adams, Drive-by Truckers, Richmond Fontaine and Allison Moorer. Since it was a regular stop-over for the Deadstring Brothers, they played to a knowledgeable crowd of around 150 (venue capacity), with a set split almost 50/50 from the Starving Winter Report and Silver Mountain CDs. Joined by Mike Lawrence in place of regular keyboard player Pat Kenneally (another of the British contingent), the sound was defined by the balance of Hammond organ through a Leslie speaker (that’s the L-100 Hammond for the purist) with Spencer Cullum’s virtuosity on pedal steel (a Sho-Bud no less), slide and electric guitars. The backline is anchored by long-term Brother Travis Harrett on drums and Jeff Cullum on bass. Without Masha, Kurt took over sole vocal duties, with harmonies from Spencer and Mike. 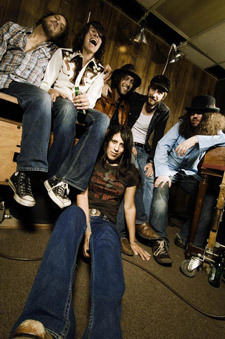 The set was perfectly paced, starting with the hook-laden rocker "For A Time," with sweet pedal steel melodies, moving through a couple of mid-period Deadstring favorites "Toe The Line" and "Talking Born Blues" from Starving Winter Report, before the sole cover Leon Russell’s "You Look Like The Devil" which is best known for Willie Nelson’s version on 1973’s Shotgun Willie. Silver Mountain served up its strongest tracks "Queen Of The Scene," "Ain’t No Hidin’ Love" and the awesome "Heavy Load" – named in reference to the long-running Rock and Blues club night in London where Kurt first met the Cullum Brothers. The UK has a good ready-built circuit for Americana-type bands wishing to tour, most of which can be found under the relevant artists’ schedules at www.americanagigs.co.uk along with several regular specialist music nights in London such as Honky Tonkin’ Sunday, What’s Cookin’ and the daddy of them all Come Down & Meet The Folks (all searchable on MySpace). Plus, with a guaranteed audience brought up on cosmic American music of the 1970s, and with emerging British artists like Two Fingers Of Firewater and Emma King and The Heart Set, the UK country rock scene has never been healthier.